Intercostal nerves is the name given to the anterior primary rami of the upper 11 thoracic spinal nerves (T1 T11) as they use the route through the intercostal spaces. The thoracic wall is supplied by the 12 pairs of the thoracic spinal nerves. Anterior and posterior rami are formed as soon as they leave the intervertebral foramina. The abdominal wall below the 12th rib is where the anterior primary ramus of the 12th thoracic nerve runs and this is why it is termed as subcostal nerve. The intercostal nerves are anterior primary rami of thoracic spinal nerves. They may be segmental in nature unlike the anterior primary rami from some other regions of spinal cord which create nerve plexuses viz. cervical, brachial, lumbar and sacral. Typical intercostal nerves (3rd, 4th, 5th, and 6th). Atypical intercostal nerves (1st, 2nd, 7th, 8th, 9th, 10th, and 11th). The normal intercostal nerve after its origin turns laterally behind the sympathetic trunk, and after that enters the intercostal space between the parietal pleura and posterior intercostalmembrane. It then enters the costal groove of the corresponding rib to course laterally and forwards. 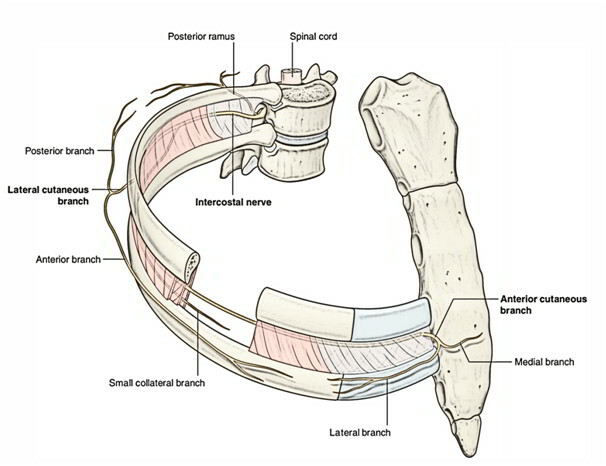 In costal groove it enters into connection with corresponding intercostal vessels and creates neurovascular bundle of the intercostal space. In the intercostal space, vein, artery and nerve be located in that arrangement from above downwards. Near the sternal end of the intercostal space, the intercostal nerve crosses in front of the internal thoracic artery. Afterward it pierces internal intercostal muscle, anterior intercostal membrane, and pectoralis major muscle to terminate as anterior cutaneous nerve. In the posterior part of intercostal space, the intercostal nerve is located between the pleura and posterior intercostal membrane. In the staying greater part of intercostal space, it is located between the internal intercostal and intercostalisintimus muscles. (a) Rami communicantes: Every nerve interacts with all the corresponding thoracic ganglion by white and gray rami communicantes. (b) Muscular branches: All these are small tender branches from the nerve, which supply intercostal muscles and serratus posterior and superior. (c) Collateral branch: It appears in the posterior part of the intercostal space near the angle of the rib and runs in the lower part of the space along the upper border of the rib below in exactly the same neurovascular plane. It supplies intercostal muscles, parietal pleura, and periosteum of the rib. (d) Lateral cutaneous branch: It appears in the posterior part of the intercostal space near the angle of the rib and accompanies the key nerve for some distance, then pierces the muscles of the lateral thoracic wall along the midaxillary line. It divides into anterior and posterior branches to supplies the skin on the lateral thoracic wall. (e) Anterior cutaneous branch: It’s the terminal branch of the nerve, which comes on the side of the sternum. It splits into medial and lateral branches and supplies the skin on the very front of the thoracic wall. First intercostal nerve: The greater part of the nerve joins the ventral ramus C8 spinal nerve to create lower trunk of the brachial plexus. The rest of the part of thenerve is quite small and it lacks both lateral and anterior cutaneous branches. Second intercostal nerve: Its lateral cutaneous branch is named intercostobrachial nerve. It lessons around the axilla and joins the medial cutaneous branch of the arm. The intercostobrachial nerve supplies the skin of the floor of the axilla and upper part of the medial side of the arm. In coronary arterial disease, the cardiac pain is attributed along this nerve to the medial side of the arm. Seventh to eleventh intercostal nerves: These nerves leave the corresponding intercostal spaces to goes into the abdominal wall; for this reason they’re termed thoraco ¬ abdominal nerves. These nerves supplies intercostal muscles of the corresponding intercostal spaces. Muscles of anterior abdominal wall, example, external oblique, internal oblique, transverse abdominis, and rectus abdominis muscles, and. Skin and parietal peritoneum covering the outer and inner surfaces of the abdominal wall, respectively. Annoyance of intercostal nerves caused by the diseases of thoracic vertebrae generates intense pain that is sent around the trunk along the cutaneous distribution of the affected nerve. It’s referred to as root pain or girdle pain. Pus from the tuberculous thoracic vertebra/vertebrae (Pott’s disease) tends to track along the neurovascular plane of the space and might point at 3 sites of development of cutaneous branches of the thoracic spinal nerve, viz. Just lateral to the sternum. Lateral to the erector spinae muscle. In herpes zoster (shingles) involving the thoracic spinal ganglia, the cutaneous vesicles appear in the dermatomal area of distribution of intercostal nerve. It’s an incredibly debilitating state. Intercostal nerve blockis given to make local anesthesia in 1 or more intercostal spaces by injecting the anesthetic agent around the nerve trunk near its origin, i.e., just lateral to the vertebra. The traditional thoracotomy (postero- lateral) is performed along the 6th rib. The neurovascular bundle is shielded from injury by lifting the periosteum of the rib. Considering the position of neurovascular bundle in the intercostal space, it’s safe to add the needle, a little above the upper border of the rib below.